This past Saturday, I did another 5k! Well, not exactly. While there was a run that morning, I chose to stick with the walkers. A really cute one, in particular. Suzie and I participated in the Kentucky Humane Society‘s annual Waggin’ Trail 5k which raises money for the animals they care for at the facilities. It was our second year participating and last year was so much fun, we knew we had to do it again! It’s a really neat event with lots of different boths where you can get things for your pet, including having them microchipped. One of our local radio stations was also there giving away prizes. Check out the crowd! 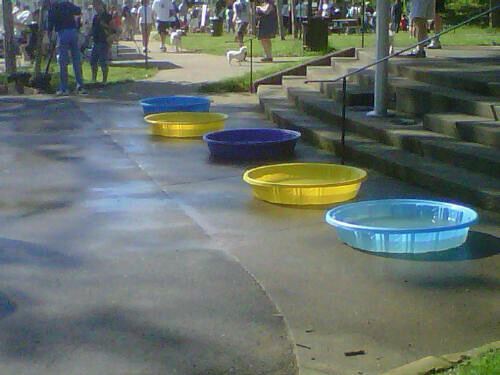 They also had plenty of doggie pools sitting out because it was quite warm and sunny that morning! 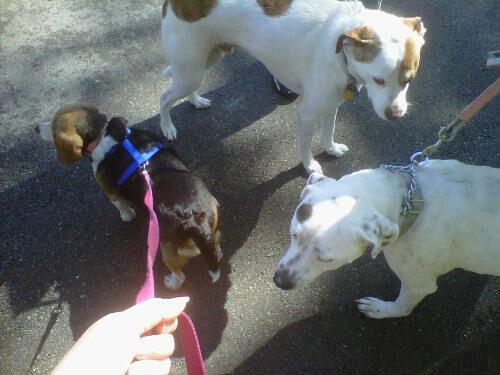 Suzie met up with her friends Bo and Bailey, who all did some sniffing while us humans waited for the walk to start. After waiting around in the shade for what seemed like forever, the walk finally started. Let’s go! 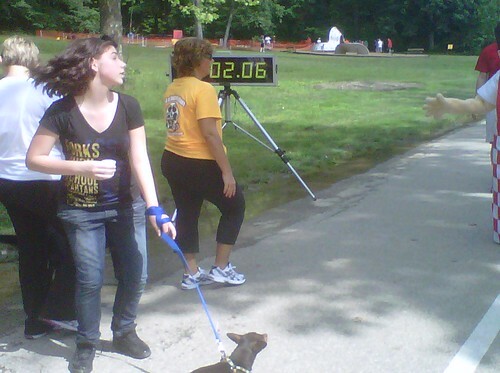 The walk/run was held at Iroquois Park here in Louisville, which is known for it’s major hills! You may have seen these a time or two if you’ve ever participated in the Papa John’s 10-miler or the Kentucky Derby Festival mini-Marathon. They are quite challenging! We finished in about an hour (1:02:06), which was pretty good for the course, the dogs and the crowd. 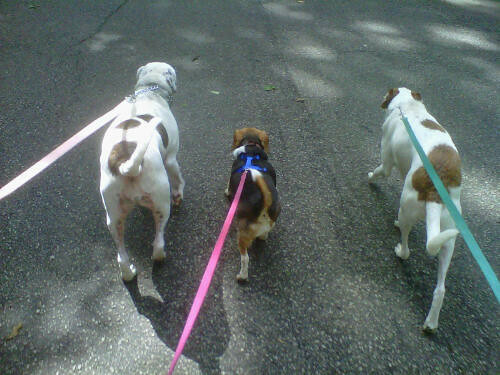 Suzie walked the whole time! I guess because she sniffed all the way from the car to the park, she got it out of the way because she didn’t stop once. 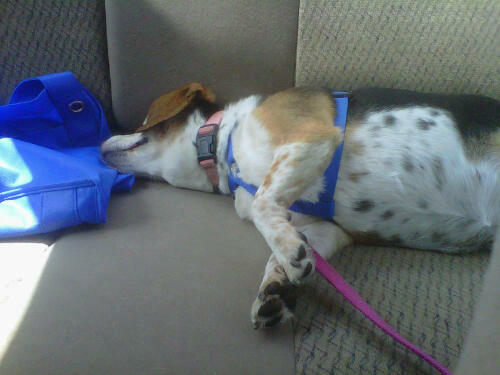 But I think she wore herself out too. 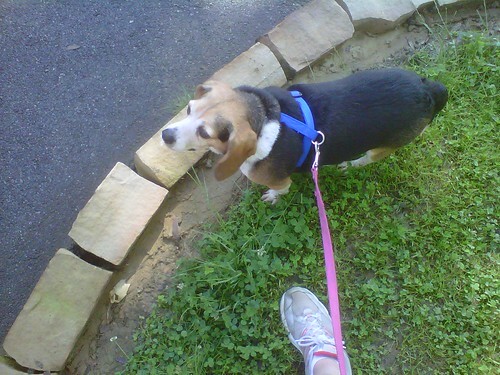 It usually takes her an hour to walk 2 miles and she did 3.1! 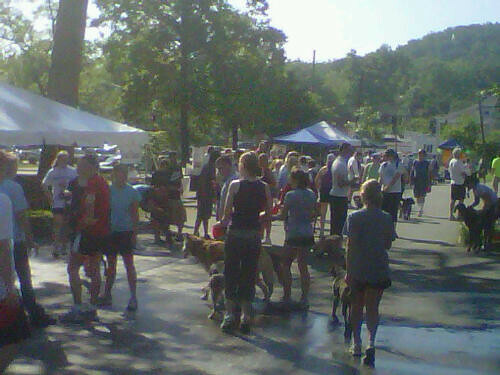 Posted on May 25, 2010, in races, Walking and tagged 5k, dogs, iroquois park, Kentucky Humane Society, Louisville, Walking. Bookmark the permalink. 3 Comments. How fun! I would love to participate in an event like that with my mom’s dog. She was adopted from a Humane society too. Hooray for rescue babies! 😀 My love is also a pound puppy and for me personally, my dogs will always either come from the shelter or a breed rescue group. What a fun event! We got one of our dogs from the HS too. I bet she would have enjoyed seeing her old friends. Our other dog we rescued too, but not from HS.